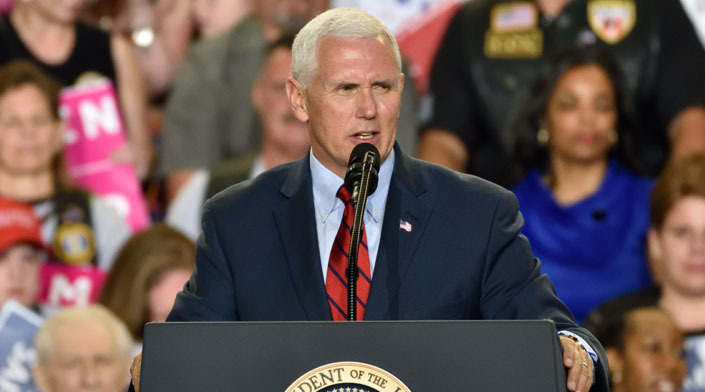 Vice President Mike Pence is at his wit’s end with South Bend, Indiana Mayor Pete Buttigieg. Although the pair enjoyed a cordial political relationship while Pence was serving as Indiana governor, Buttigieg has since turned on the vice president, denouncing his “fanatical religious conservatism” and his stance on marriage equality and gay rights. After initially keeping quiet on the subject, Pence finally broke his silence on Wednesday, saying in an interview with CNBC’s Squawk Box that Buttigieg “knows better” than to attack his Christian faith. Pence said that Buttigieg has changed since announcing his 2020 presidential bid. He attributed the gay mayor’s defamatory comments to a desire to stand out on the campaign trail. “But I get [it],” Pence continued. “You know, it’s — look, they got 19 people running for president on that side in a party that is sliding off to the left. And they’re all competing with one another for how much more liberal they are than the other. So I get that,” he said. For his part, Buttigieg has described his relationship with the vice president as “complicated.” But some Indiana Democrats have criticized Buttigieg for not doing enough to stop Pence’s opposition to marriage equality reforms when he had the chance. After then-Gov. Pence passed a “religious freedom” law that many on the left considered anti-LGBTQ, Buttigieg responded by saying he was “disappointed” that Pence signed the bill, but welcomed the governor with open arms to a South Bend event just a few weeks later. “I’m focused on how we can work together across city limits and across the aisle,” Buttigieg said at the time. But Tony Flora, president of the North Central Indiana AFL-CIO chapter, said that the mayor has trouble translating rhetoric into action. Writing on his autobiography, Buttigieg provided an unlikely excuse for why he didn’t push Pence to veto the religious freedom bill: “I wish I could say I made a good effort to talk him out of it, but it was clear from the look in his eyes that he had made up his mind,” he wrote, describing a meeting between Pence and other Indiana mayors. Pence, meanwhile, told CNBC that he accepts the way the country has evolved toward gay marriage, although he says he will not compromise his Christian values to conform with society. Benjamin Baird is a senior staff writer for the Conservative Institute. He is a veteran infantryman of Iraq and Afghanistan with over 1000 days in combat and holds a degree in Middle Eastern studies from the American Military University. Ben is a regular contributor at the Middle East Forum and has written for dozens of conservative publications, including The Daily Caller, American Spectator, American Thinker, New English Review and Jewish News Syndicate.